We banded together to visit Bali again. Each of us has gone on our own trips but not as a group specially to sketch and paint. I have always wanted to dedicate a trip just for that so I eagerly agreed to visit Bali again with my friends (James Tan and Teoh Yi Chie). It has been a wonderful 4 day trip, eating, painting, sketching and going for massage. Unforgettable! Here's a video I filmed and edited of the sketchbook I brought along with me to Bali. Besides, I sketched and painted on loose sheets of watercolour papers too. The one below was done at the Elephant Cave Temple, Goa Gajah. 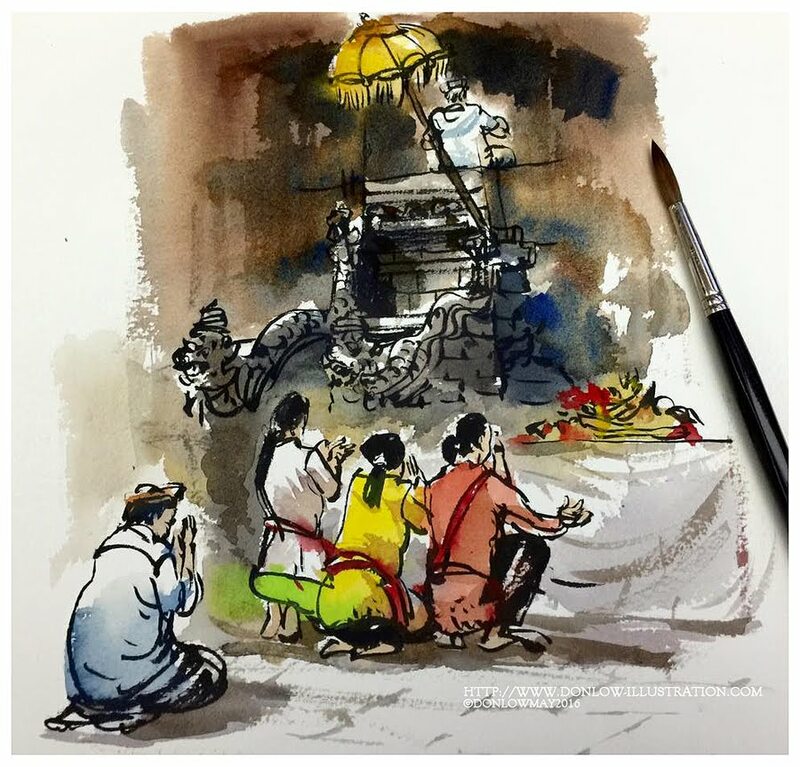 A temple ceremony was going on at the same time so I wasted to time sketch the process. However it was over sooner than I expected. I could only manage to capture a couple of people praying and being blessed by the priests. Some lingered to pray even after the ceremony was over. This gave me some extra minutes to sketch more. I didn't fill in the colours until I got back from the trip. 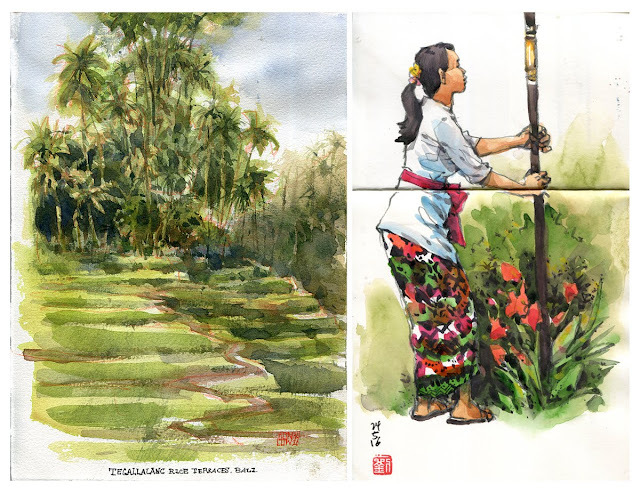 While we were having lunch at the Tegalallang Rice Terrace Cafe, I did 2 watercolour sketches of the rice terrace, one which was not completed. The first one was meant to be a warm up (shameless defending myself for the lack of skills to complete a good one). Then the second one which I couldn't finish. 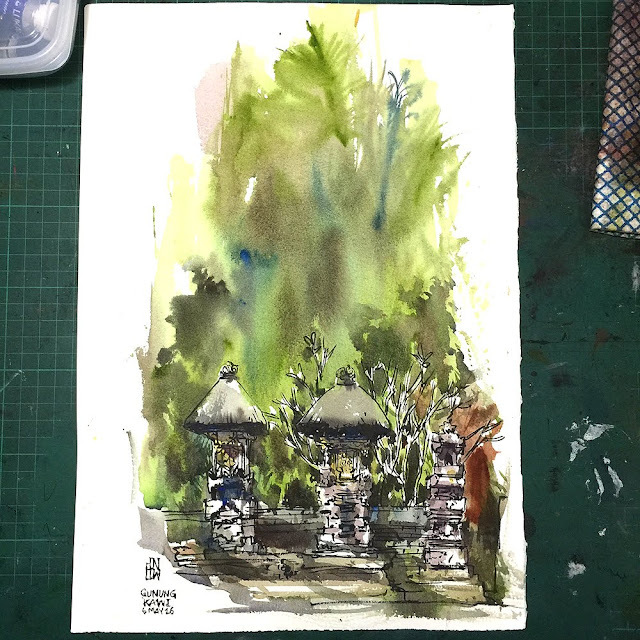 It was only 3 weeks after I came back I did complete it in the studio, along with a painted watercolour of a Balinese girl carrying a ceremonial umbrella known as "Tedung" in the Balinese language, done in the studio from a photo I took. The one regret I have from the trip was not being able to paint or sketch more of the Balinese women. At Gunung Kawi I did another ink and watercolour painting which I completed on location, like a plein air painting, enduring the heat, humidity for a single piece for about one and a half hour. Enough to make me perspire profusely throughout and getting a rash. But it was all worth it. And finally a triptych of Goa Gajah done with Pentel Brush pen on Saunders watercolour papers. This is my favourite and I would be scanning them in hires before I frame them up for display in the studio. I wish I could have done more during the trip.